I won’t lie—after Saturday’s tough loss to the Phillies, I didn’t turn on the Mets’ game on Sunday right away. As you may’ve read before, raised by Mets fans in Philadelphia, I have a special kind of loathing for the Phillies. I saw my first several Mets’ games at the Vet; in sixth grade, the Phillie Phanatic gave me a noogie on the Jumbotron. This is what made Saturday’s game so hard to watch, and Sunday’s game so damn sweet. Game 2 of the 1973 World Series houses the longstanding team record for most runs scored in a World Series game. (They scored 11 in Game 2 of the NLCS in 1969 against the Braves, and 10 in Game 4 of the 2000 NLCS against the Cardinals.) Cleon Jones and Wayne Garrett each hit a home run, with Jones scoring three of the of the runs that night. Though the Mets went on to lose the Series, they took the A’s to seven games, and this one in particular was an example of how they’d outlasted season expectations—the ’73 team also holds the record for the club with a lowest winning percentage, .509, to win the pennant. Talk about fireworks—the Mets had a grand ol’ Fourth in 1985 when they set the team record for most hits in an extra-innings game. The Mets got 28 hits over the course of 19 innings in an eventual 16-13 win over the Braves. The game featured a particularly strong showing repeat hitters, especially catcher Gary Carter who led the team with five hits, Wally Backman and Keith Hernandez with four, and three each from Darryl Strawberry, Howard Johnson, Ray Knight, and Lenny Dykstra. In my very first months of Mets fandom (and life), the Mets shelled starting pitcher Greg Maddux at Wrigley Field for a 23-10 win over the Cubs. Darryl Strawberry narrowly missed hitting the cycle with a walk, two doubles, a triple, home run and a stolen base, scoring five runs and five RBI. Lenny Dykstra and Keith Hernandez each scored three runs, and Wally Backman and Howard Johnson scored a pair each, with the team slashing .447/.518/.766 for the day. That game was hardly a one-off, though; the Mets have racked up a lot of club records against Chicago. On June 13, 1990, the Mets set their team record for most runs in a doubleheader with back-to-back high-scoring wins against the Cubs: 15-10 and 9-6. The first game of that day, along with the 19-8 win the day before is also the Mets’ record for most runs in two consecutive games. On July 16, 2006 the Mets hit 11 runs in the sixth, the team record for most runs scored in a single inning for nearly a decade. They upped the record this April when they beat the Giants 13-1 with a 12-run third inning. The Mets also tied their team record for most stolen bases in a game (six) while playing the Cubs on August 4, 1982; the other two times were against the Phillies in September 9, 1963 and April 10, 1992. And while it wasn’t record-breaking, the Mets gave the Cubs an impressive walloping on September 5, 2010 with an 18-5 win. 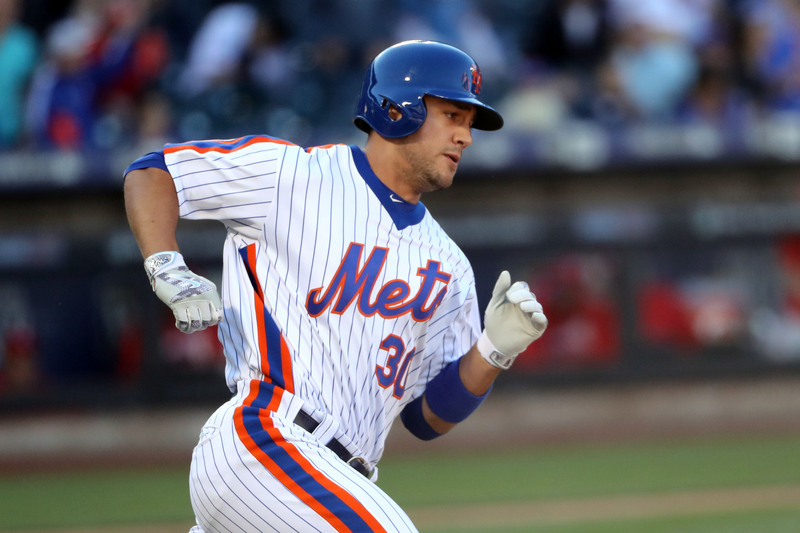 The game featured only two home runs (by Ruben Tejada and Ike Davis) but many repeat scorers: Davis and Josh Thole each scored three, while Carlos Beltran, Mike Hessman and Ruben Tejada scored two each. And, in perhaps the rarest Mets feat of all, Jon Niese actually got a win. If I could wish for a repeat of just one of these games, the 1991 season finale in which David Cone shut out the Phillies, might be it. Cone gave up only three hits and struck out 19, the second-highest ever total strikeouts for a regular length game, a feat also accomplished by Tom Seaver. Two runs by Daryl Boston and three by second baseman Keith Miller (including a homerun each) made up a bulk of the Mets’ points for the game. A fun memory from last year’s epic run-up to the postseason, this game raised the team record of most home runs scored in a single game to eight: Wright, Lagares, d’Arnaud, Cuddyer, Cespedes and Murphy each hit one out of the park, and Wilmer Flores had a pair and five RBI. The team’s previous record of record of seven home runs in a single game had also been set against the Phillies, in a 16-4 win on April 19, 2005. Part of me wishes the Mets had saved some of last Sunday’s 17 runs for later, but most of me is just rooting for another run of big ol’ Mets-Phillies beatdowns. Either way, this weekend promises to be an exciting sprint toward what is hopefully just the beginning of Mets October baseball.